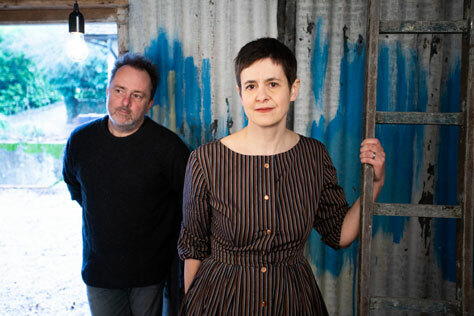 We’re delighted to be working with the Catenary Wires for the first time! The Catenary Wires are Rob Pursey and Amelia Fletcher. They specialise in emotive indie duets, capturing the spirits of Nancy Sinatra and Lee Hazelwood, Serge Gainsbourg and Brigitte Bardot, and releasing them into modern Britain. In their previous lives, Amelia and Rob featured in indie bands Talulah Gosh, Heavenly and Tender Trap. Live, The Catenary Wires become a five-piece, with musical heavyweights Andy Lewis (Paul Weller Group, Spearmint) on bass and cello; Fay Hallam (Makin’ Time, Prime Movers) on Hammond organ and backing vocals, and Ian Button (Death in Vegas) on drums. The new Catenary Wires LP, Til the Morning is available on Tapete Records from 14 June. The album was recorded during 2018 at the Sunday School, in the middle of nowhere in Kent. It is a big step forward from their first album (Red Red Skies on Elefant Records/Matinee Recordings): more complex and more beguiling, with a multi-layered sound that reflects a range of additional instruments, including harmonium, bells and an old trailer. It was produced by Andy Lewis, who has recently produced albums for Judy Dyble and French Boutik. Track 1, Dream Town, is the first single from the album.